The eye is essentially transparent, transmitting light with only minimal optical attenuation and scattering, providing easy optical access to the anterior segment as well as the retina. For this reason, ophthalmic and especially retinal imaging has been not only the first, but also most successful clinical application for optical coherence tomography (OCT). This chapter focuses on the development of OCT technology for retinal imaging. OCT has significantly improved the potential for early diagnosis, understanding of retinal disease pathogenesis as well as monitoring disease progression and response to therapy. Development of ultrabroad bandwidth light sources and high speed detection techniques have enabled significant improvements in ophthalmic OCT imaging performance, demonstrating the potential of three-dimensional, ultrahigh resolution OCT (3D UHR OCT) to perform noninvasive optical biopsy of the living human retina, i.e., the in vivo visualization of microstructural, intraretinal morphology in situ approaching the resolution of conventional histopathology. Significant improvements in axial resolution and speed not only enable three-dimensional rendering of retinal volumes, but also high definition, 2D tomograms, topographic thickness maps of all major intraretinal layers as well as volumetric quantification of pathologic intraretinal changes. These advances in OCT technology have also been successfully applied in several animal models of retinal pathologies. The development of light sources emitting at alternative wavelengths, e.g., around ∼l,050 nm, not only enabled three-dimensional OCT imaging with enhanced choroidal visualization, but also improved OCT performance in cataract patients because of reduced scattering losses in this wavelength region. 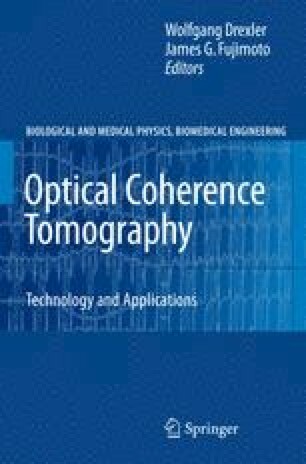 Adaptive optics using deformable mirror technology, with unique high stroke to correct higher order ocular aberrations, with specially designed optics to compensate chromatic aberration of the human eye, in combination with 3D UHR OCT, recently enabled in vivo cellular resolution retinal imaging.